Grocery shopping at any major supermarket after September is a grim affair. You battle the elements to get there, and chart the gradual progression of your nose as it moves from frozen stiff, to beginning to burn, to an emergency tissue situation. You sweat profusely in your jacket, and battle old ladies for the last, flavourless tomato and chemical-coated produce from faraway countries. With school almost behind you, at least in theory, there is time to explore some of Toronto’s many alternatives to convenient, big box grocery stores over the winter break. You can still find flavourful, locally grown fruits and vegetables in the city for belly-warming soups, hearty salads, and roasted veggies ­— even in the bitter cold of winter. Farmers’ markets, Community Shared Agriculture (CSA) bins, and organic delivery services are all among the different ways to get fresh food throughout the year. These events and services support local farmers by offering their seasonal, organic, pesticide-free produce ­— rather than the imported fruits and vegetables likely to be found at the grocery store. Once you’ve acquired your locally-grown and ethically-sourced produce, here’s a couple of recipes to try out. Why are those carrots purple? What’s the difference between butternut and acorn squash? How do I cook beets without staining everything I own? The best part of visiting a farmers’ market is that it transforms shopping into an interactive experience. Unlike the sullen teenagers packing produce onto grocery store shelves, the vendors at farmers’ markets welcome questions about their produce, and they’re happy to dispense advice on everything from their products’ origins, to proper storage, to cooking tips and tricks. 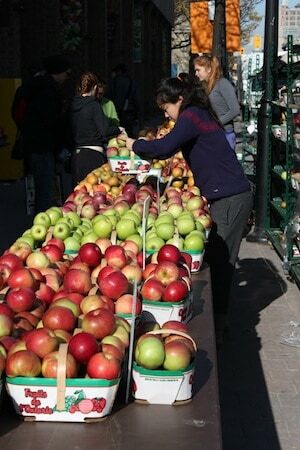 The number of farmers’ markets in Toronto dramatically decreases during winter due to the harsh climate. Nevertheless, a brave handful of them move their vendors indoors and remain open all year long to continue to offer local food to their customers. Winter farmers’ markets are distinct for their strong community followings. Vendors and customers often know each other by name and are notably warm and welcoming to newcomers. In the winter, when produce is sparse, there is a particular sense of togetherness as everyone copes communally with this seasonal struggle. Located in St. Lawrence’s north market, this spot has been operating since 1803. In terms of vendor variety and sheer size, it’s hard to beat. The vendors are there before daybreak, so it’s best to skip breakfast at home, head over early, and pick up freshly made coffee and scones at the market itself, browsing while you eat. You’ll find everything you need here throughout the year: fresh produce, cheese, free-range eggs, German pretzels, honey, meat, and — perhaps most importantly — a wide variety of freshly baked goodies. When you’re done picking up produce, you can head over to the south market and sample the mustards, olives, and peameal bacon sandwiches. The St. George campus farmers’ market has unfortunately closed, but the Scarborough market is alive and well. Once a month, the market provides an opportunity for local farmers, producers, and artisans to connect with UTSC students, staff, and the local community. They have also lined up vendors selling local produce, honey, bread, and freshly-baked desserts, so it’s certainly worth the commute to visit. The Stop’s farmers’ market is easily one of the most beautiful in the city, and is located fairly close to the St. George campus. The emphasis here is on local, sustainable agriculture. Most of the farms are certified organic and the non-farmer vendors buy their ingredients from farmers in the same market. You can also get various local artisan specialties here, such as olives, jams, chocolates, and crackers. There’s a wide variety of food available each week, but if all the produce shopping starts to get you hungry, you can stop by The Stop’s Market Cafe, which is open during market hours, and serves up sandwiches, treats, and soups. The aromas will have you drifting in the cafe’s direction long before you even realize that you’re craving a hot bowl. The scones are divine, and are grilled and buttered right before your eyes. The winter market that takes place inside the rink house at Dufferin Grove Park is a slightly subdued version of the bustling market in the summer. Snowsuit-swaddled children holler and play while parents browse through the many vendor stands. The price point here is a little higher than in some of the other markets in the city, but most buyers consider it worthwhile for the pesticide-free produce. Moreover, the vendors are all extremely knowledgeable about their produce, and are happy to explain the costs that go into producing each item, should you be so curious. With all its vendors growing their produce within 200 kilometres of the market, Evergreen is another venue that is committed to locally sourced, seasonal food. The market is easily accessible by car, but the coordinators at Evergreen have also made it easy for commuters to visit as well. The market schedules a designated shuttle bus that runs there seven days a week, and a TTC bus that goes there every half-hour on market day. It’s worth getting there extra early to explore the surrounding gardens and buildings before grabbing your groceries. Given the size and popularity of this year-round farmers’ market, it is certainly surprising that it has only been around for five years. The Sorauren Market came about as a result of the West End Food Co-op. It is a collaboration with FarmStart, an organization that seeks to help newly established farmers and food vendors get on their feet. 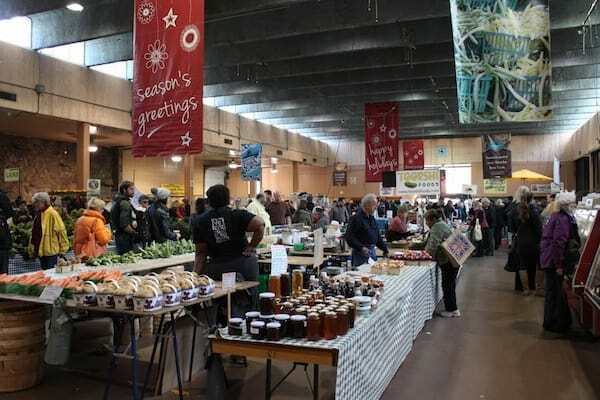 Even in the winter, when the market moves into the nearby field house, there are more than 20 farmers and food vendors ready to sell you fresh, Ontario-grown produce and provide advice for creative ways to cook with your winter goods. 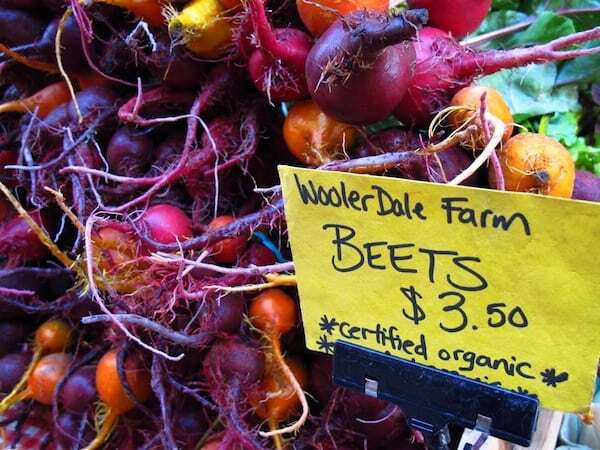 This is the first year ever that the Toronto Botanical Garden Organic Farmers’ Market will be open year-round, so supporting its vendors to illustrate the demand for their winter hours will be helpful to the business, and your stomach. A number of TTC buses departing from Eglington station head past the park, making the commute an easy one. Before you shop, check out the botanical gardens — the grounds are still beautiful when covered in snow and ice, and you’ll have them all to yourself. Not everyone wants to brave the winter weather and risk TTC crowding or breakdowns for the sake of purchasing local produce — but there is an even more convenient option than the grocery store for the couch potatoes. Torontonians have access to a number of companies who deliver Ontario’s winter finest right to your doorstep, or to a community drop-off depot nearby. Some involve signing up for Community Shared Agriculture, a system by which you buy shares of a farm’s harvest. Other companies work with farmers directly, and eliminate middlemen as much as possible in order to bring produce to their members at a very reasonable price. These services not only save you the trip to the grocery store but also directly support farmers, and enable you to engage in a truly seasonal, local diet. Produce varies with each delivery, based on what is good and fresh at the farm, so what you receive can be somewhat of a surprise each week. In case you were wondering what to do with that rutabaga that came in your delivery — and who wouldn’t be, really? — all of these companies offer you recipe suggestions, whether they come in a newsletter attached to your bin or from the recipe section of their websites. Cost: A small share costs $25 a week, and comes with a local-produce-only option for the same price. Plan B has been running its CSA boxes for over 13 years. The certified organic produce comes twelve different farms across southern Ontario. They offer a weekly organic CSA share for winter and early spring. The 22-week season begins in early January, and finishes at the end of May. Plan B is pickup-only for Toronto, and offers a number of Toronto-based depots — including ones in Etobicoke, the Danforth, the Junction, Withrow Park, the Beaches/East York, and North York. Cost: Small boxes cost a mere $13 and it’s $24 for all-organic produce. Foodshare’s Good Food Box is a non-profit produce distribution system. Individuals place orders for boxes with volunteer coordinators in their neighbourhood, and receive a box of produce on a weekly, bi-weekly, or monthly cycle. There are some serious savings to be had from the Good Food Box, and in case there is no pickup depot near you, you can become a volunteer coordinator and start your own — so long as you have 8-10 other people who also want to participate. This flexibility is unique to the Foodshare program, and, in combination with its very reasonable prices, makes the program a viable option for students who are seeking a compromise between cost-effectiveness and a local diet. If you live downtown, Foodshare runs pickups out of the UTSU office at 12 Hart House Circle and 49 St. George Street every other Wednesday of the month. There has also been talk of expanding the program to UTM in the near future. Cost: $27.50 for a small basket, $25 for a small local produce only basket, plus a $2 fee if you wish to customize the contents of your basket. Delivery is free for orders over $25; otherwise, it’s a $2 fee. Mama Earth’s goal is to provide a service for its members to have access to the freshest organic items available at a fair price. Local farms are given priority in their sourcing. Through their website, you can sign up for weekly delivery boxes, with the helpful option to opt to skip a week on occasion. Boxes come in a number of sizes and allow customers to prioritize local produce. They are delivered to your doorstep each week. Cost: $37 for the smallest “Harvest” basket, or a minimum order of $47 if you want to customize your own produce. Green Earth Organics delivers organic groceries to homes and offices across the GTA. It offers a wide selection of certified organic fruit, vegetables, and other grocery products. Products are delivered to your doorstep for no additional charge. Cost: $25 for a fruit and vegetable bin, with a local-only option for the same price. They offer two free substitutions to the produce for their weekly baskets, or, for $25, you can completely customize your own bin. Wanigan is a fresh produce company that has been operating since 1997 and has made more than 250,000 deliveries across the GTA. In addition to organic produce, Wanigan carries organic dried fruits, nuts, and gluten-free items. Bins are delivered to your doorstep for no additional cost. Cost: $27.99 (without delivery fee) for a regular box, or you can order a bin directly from the service’s online store and customize the contents yourself. It’s a $3 delivery fee if you want the groceries delivered to your doorstep; however, if you live in a house or apartment with more than three people ordering from Fresh City, it will waive the fee. Fresh City Farms harvests from their sites all over the Toronto, which collectively make up over four acres of land. You have the option to pick up your box from its many depot locations, including (but far from limited to): 401 Richmond Street, I Deal Coffee at 162 Ossington Ave, The Depanneur at 1033 College Street, the Toronto Vegetarian Association at 17 Baldwin Street, and Patagonia at 500 King Street West. This produce is grown directly in Toronto, so the produce is immediately local. Cost: $37 for the basic box; $42 for the wholly-customized one. Front Door Organics prioritizes Ontario-grown food and producers, though its organic produce is also sourced from outside the province during the winter. In addition to fruits and vegetables, it offers locally raised, certified-organic meat. Its products are delivered to your doorstep, and the cost is included in the price of the boxes; however, if you live outside of the delivery area, it offers a pick-up service from its warehouse, located in Etobicoke. Pick-ups receive a $3 discount.